Many games would have you believe you are nothing more than a weapon. In a sense this is all part of a game’s remit to sell the power fantasy so many of us crave. People are imperfect. They make mistakes. A gun, a sword, or any other number of destructive devices do not make mistakes. If a gun is fired or a sword is swung, it must be what had to be done, by the player within the game. Weapons aren’t complicated. Be a weapon. Weapons are absolute. Game players have been a lot of weapons over the years. Our view of the world poking out over the top of the barrel of a gun in the centre of our screens, urging us to move forward and kill. Yet even in Wolfenstein 3-D there was the semblance of a character. We knew of a man named BJ Blazkowicz. We knew what he looked like and we knew of his proficiency for killing nazis. In 1993 id Software changed all of this. 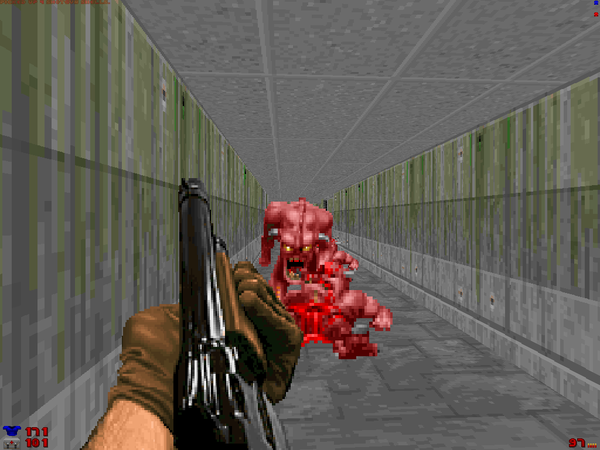 We inhabited a space colloquially known as “Doom Guy”. The idea was that he was simply an avatar for the player to transplant themselves into. A somewhat radical idea then to say you are no longer controlling a character. It is yourself that is in the game. You are the one shooting, killing, and saving the world. Except that’s not really true, is it? You are a gun. You are that famous shotgun with its slick pump action animation and booming sound effects. You could not kill a cyber-demon, but a gun could. It has been far too easy to equate characters with weapons. In Call of Duty the rifles and pistols all feel like natural extensions of your characters. In Dishonored it is hard to imagine the assassin Corvo reaching out without some kind of sharpened edge grasped firmly in his gloved fist. He reaches out to stab. To aim. To kill. As often as this occurs, there are games that seek to buck this particular trend. 2012’s Receiver made an attempt to complicate the simplistic image of the gun. The weapons portrayed in that game were complicated. 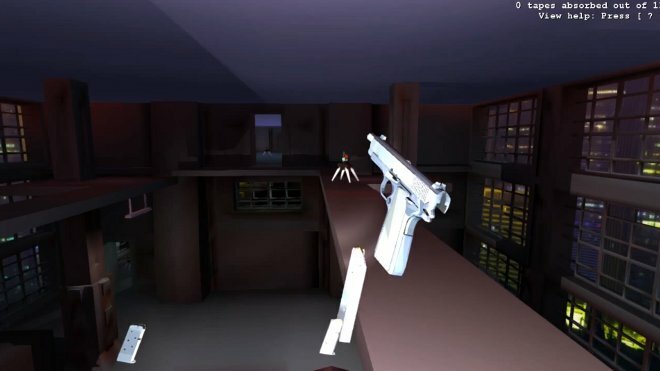 The player was given full control over every aspect of the firearm. They could handle the magazines, spin a revolver’s chamber and fiddle with the hammer. The safety could be switched on and off, or the slide pulled back to inspect the chamber. There was no player model though. Just a floating weapon presented in an incredibly functional form (or nonfunctional if you, like myself, actually had trouble figuring out how to actually handle and fire the gun correctly). So is there a way to separate weapons from the characters that use them, without removing the character completely? Thankfully the answer to that is yes, and The Witcher 3: Wild Hunt is one of the best examples of how to achieve that separation effectively. It is a game that does everything in its power to convey one simple message. A person is not a weapon. One of the most successful ways CD Projekt Red have communicated this idea is through both Geralt’s character model, and the models of his twin swords. As he traverses the game’s world he is rarely without his blades. A silver one is reserved for the slaying of monsters, while the steel one is used to cut down men. While the swords are strapped to his body, enough attention has been paid to them to ensure that they do not appear to simply be bolted onto his frame. The developers have worked hard to make the weapons look and act like distinct physical objects. There is a sense of weight to the way they are jostled and shook as Geralt runs about questing. They are for all intents and purposes definite objects. Tools the witcher needs to carry out his day job. The fact there is one reserved specifically for monsters heightens their utilitarian aspects. They are always at hand when they are needed, but Geralt does not need them to be complete. Compare this to another well known third person action game character, such as God of War’s Kratos. Like Geralt, Kratos’ chosen weapons primarily swords. He is rage personified and a literal god. His blades are actually chained to his arms. When he attacks they stretch out and whirl through their ballet of blood at ranges not generally accomplished by your bog-standard, unchained swords. The attacks are controlled and precise. 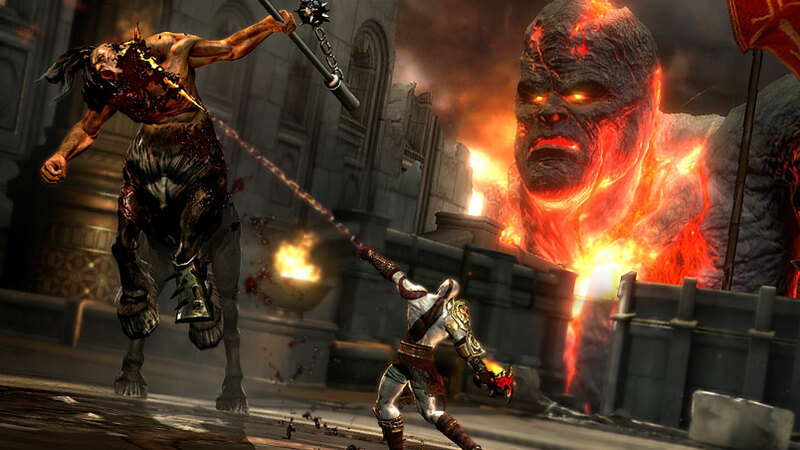 The weapons always act in the way Kratos and the player expect them to. Then when the combo counter has stopped climbing and another deity lays slain at his feet, they snap back into his clutches, ever ready for the next brawl. These are not distinct items with their own sense of self. They are Kratos. They are his anger. Kratos maintains total control because he is not manipulating a pair of tools, he is performing actions that come as naturally to him as breathing. This is a common trend across the board when it comes to third person action games like God of War. In some ways the lead pipes in Streets of Rage demonstrate more physicality than the swords, spears and hammers of most modern hack n slash games. The solidity of the Witcher’s blades, the way they move or are withdrawn from their sheaths is important. In a way this definition of the blades acts to enhance the way violence is enacted on-screen. Within the mind of the player the swords are subject to a certain heftiness. CD Projekt Red have also implemented dismemberment effects, occasionally resulting in men being cleft in twain. Limbs fly, heads roll, and it can sometimes be genuinely unsettling when you quite unexpectedly inflict such carnage on a human body. No doubt this is heightened by our relationship to the very weapons we use, and how Geralt’s body reacts to swings and knocks. It lends an uneasy kind of horror to battles that so many games fail to ever produce through their mechanics. That only tells half the story though. The use and exertion of control must also be considered. In a rare moment when the screen is not filled with ongoing evisceration, Kratos will place his swords upon his back. Press attack or block, and the blades will appear instantaneously in his hands. There is no transitional period between docility and violence. One could not imagine Kratos ever being without his razors. Geralt on the other hand spends much of the time with his swords sheathed. When not engaged in combat Geralt will wander about with his hands free. That is unless the player makes the conscious decision to loose one, at which point you may attract the disapproving ire from any nearby guards. It does make sense. If Geralt is not hunting or fighting, why would he have any need to handle his weapons? They are tools for a task he is not engaged in. This lends a certain amount of intent to the act of actually drawing the swords, something that has been absent in all of the other games mentioned so far. In another instance the story demanded I teach some ruffians a lesson through the tried and tested medium known as the fist fight. Thinking I would speed things along I hit the button on my controller to draw my steel sword. I emerged victorious from the encounter, not because I had carved the looters into bloody chunks, but because they surrendered as soon as they caught a glimpse of steel. I had communicated my intent through one simple action. Pulling a sword from its scabbard or dragging a gun from its holster more often than not conveys absolutely nothing in most games. It is a hollow action, standing between the player and the violence the game wants them to commit. Really then, how much of a message could that one act even convey when not even the violence is considered? So the Witcher 3 again hammers home the sense of purpose Geralt grants to his weapons. That purpose is then immediately clear when they are called into action. Another moment that stands out is early on, when the player takes control of Ciri, Geralt’s daughter. It becomes apparent after some sleuthing that there is a werewolf on the prowl. Ciri possesses supernatural powers that Geralt does not. It would be easier then to consider her body as a weapon, and to indulge in the trope that so far the game has shied away from. The way in which Ciri is able to teleport through battlefields could potentially enable her to treat her sword as an extension of herself. Yet again the game refuses to do this, and tasks you with gathering ingredients to concoct as oil that, when applied to a sword will give it an extra edge against werewolves. Again the game explicitly states that the sword is merely a tool that needs to be adapted, to meet the specific requirements that emerge from any given situation. Geralt and Ciri both have amazing martial prowess, but they are not unstoppable. Unlike Doom Guy, Call of Duty protagonist #147, Kratos or any number of other characters. The protagonists of The Witcher 3: Wild Hunt can be surrounded and brought down with a swiftness rarely seen in big budget blockbusters. They are not weapons. Their power comes from their skill and dexterity. Knowing when it is appropriate to use them and when to to employ a considered, more human approach. Rather than the weapons, they are in total control.